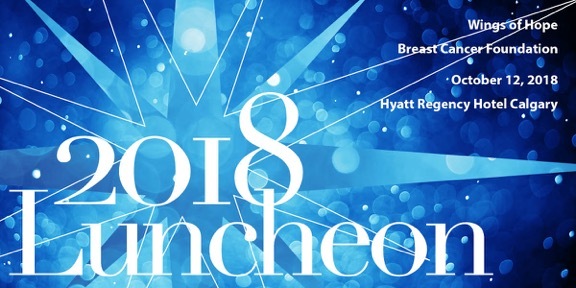 Wings of Hope Breast Cancer foundation are pleased to announce the return of our annual luncheon. This event will be held 11a.m. – 1:30p.m. Friday October 12, 2018 at the Hyatt Regency Calgary. Join us as we “Celebrate The Sparkle Within”. We welcome Global News’ award-winning anchor, Gord Gillies as master of ceremonies. We are also delighted to host Rachel Mielke, founder and CEO of Hillberg & Berk ,as our honoured guest. Each year, this event acts as our core fundraiser. Funds raised from our luncheon help to lift the financial burden for individuals living with breast cancer in Calgary and surrounding areas. Tickets are $100 each or $1,000 for a table of ten, and available on eventbrite.com. Wings of Hope Breast Cancer Foundation is a 100% volunteer driven foundation that offers support to patients undergoing, or who have recently undergone, breast cancer treatment at the Tom Baker Cancer Centre. Our funded programs allow patients to focus on recovery instead of how they will pay rent, buy groceries, get to treatment, or afford desperately needed medications. In the past 5 years we have raised over $1,000,000. 95% of these funds directly went into the hands of those we served. .